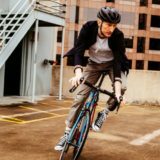 One of the most crucial pieces of clothing for comfortable cycling is a good jacket. But in the pursuit of finding the best cycling jacket, what should you be looking for? Well, there are 10 key things to consider. 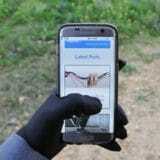 Water resistance: how well will the jacket protect you from rain? Breathability: will the jacket let your body breath or may you as well be cycling in a bin bag? 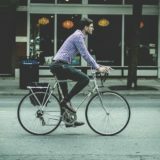 Stretch: does the material have some give for natural cycling movements? 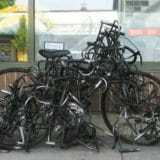 Fit: has the jacket been designed with the mechanics of cycling in mind, e.g. does it have a longer back and articulated sleeves? Visibility: is the jacket reflective? Does it help you be seen at night or in low-light? Pockets: do you have a secure place for your keys, phone and wallet? Will they stay dry? Hood: will it keep your head dry? Can you hide it away when you don’t need it? Storage: can it be easily packed away in a bag or pocket when you don’t need it? Style: does the jacket look good or does it scream “CYCLIST!”? Price: is it reasonably priced for what you get? It seems a lot to think about, doesn’t it? But don’t worry, that’s why I’m here. 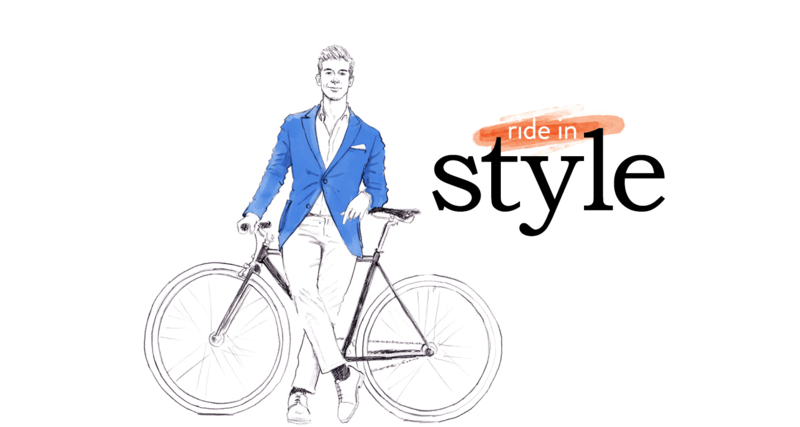 I’ve put in the hours and research to help you cycle in style. 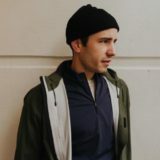 This post has set out to bring you the best cycling jacket for cold weather, with five options for both men and women. That’s cold, by the way, not freezing. We’re talking 5˚C to 18˚C – effectively 80% of the weather you’ll face in the UK. Okay, we now know what we want, right? Well, kind of. A perfect blend of: functionality, practicality, style and value. Easy. I’ll start with the best stylish waterproof cycling jackets for men, before going through the top five cycling rain jackets for women. If you want to skip straight to the lady’s section, click here. 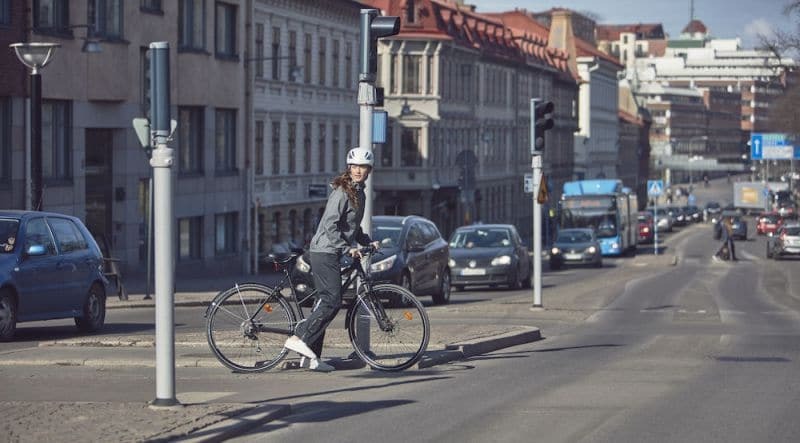 Replacing the hugely-popular Endura Urban Shell Jacket, the Flipjak is one of the most innovative products in the urban cycling world right now having found an interesting solution for those who want visibility AND style. You see this isn’t really a jacket. It’s two jackets. Worn one way, it’s a very chic ocean blue (or black) urban cycling jacket, perfect for ambling around town in style. 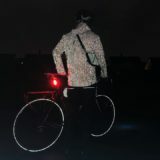 But if you turn it inside out you’ll find a high-visibility reflective cycling jacket, ready for riding in low-light. 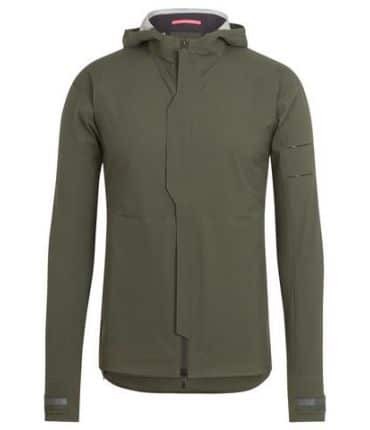 This jacket is very much a cool weather piece and has been designed to keep you warm at around 8˚C to 10˚C with just a t-shirt underneath – so this shouldn’t really be thought of as a lightweight summer jacket. Also, this isn’t one of the more breathable jackets around – which is fine for casual riders in cool weather – but if you like to dash about at Froome-like paces, you’ll overheat in the Endura reversible jacket. Both sides of the jacket offer a chest pocket, while the “stylish side” also has two zipped hand pockets too. 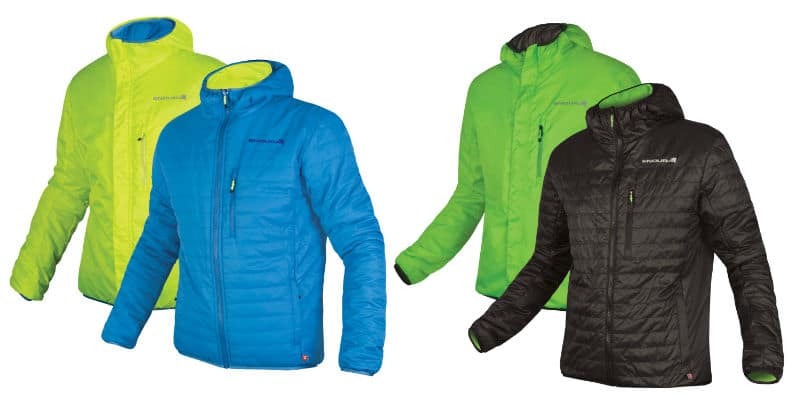 If you’re on the lookout for a warm jacket that looks good and offers heaps of visibility, the Endura Flipjack may just be what you’re looking for. This jacket originally retailed for £119.99, but you can now pick it up for under £100 from the likes of Wiggle. Summary: A great jacket for cycling in cold weather with the option for super high-vis when you need it. Buy at Tredz now from £85.99. When it comes to finding the best, most stylish cycling gear, Rapha are never far from the list. Their City collection sets me drooling every time I see it, and the Rapha Hooded Rain Jacket is no different. The Hooded Rain Jacket is packed out with cycling-friendly features, while maintaining a cool urban style. 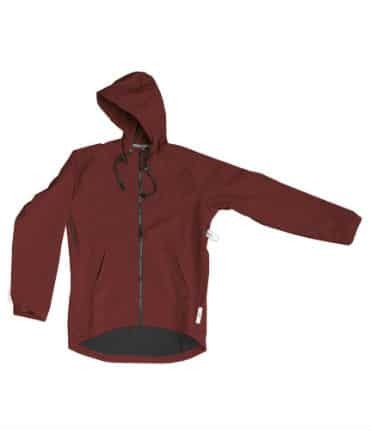 There’s a tuck-away hood that even fits under a helmet, it’s water-resistant with taped seams, has reflective details, offers a good amount of stretch, is lightweight and has vent-holes under the arms as well as a breathable Nylon fabric. As you can see, it’s ticking pretty much every box we set out in our pursuit of the perfect stylish cycling waterproof jacket. 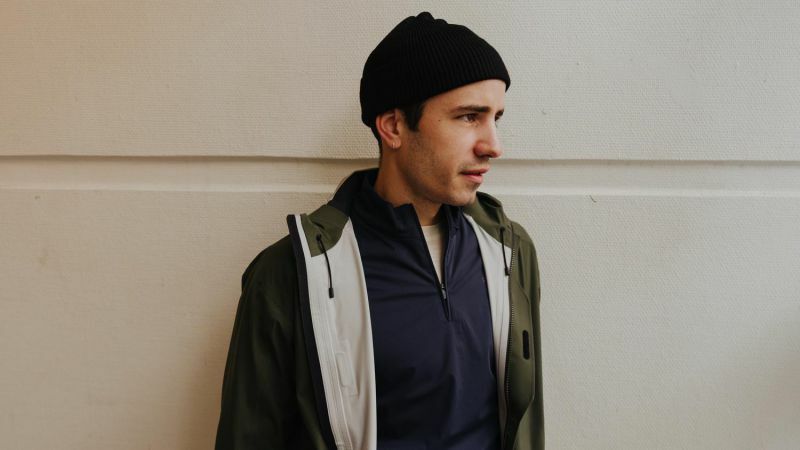 It’s predecessor, the Rapha City Rain Jacket, was a very good product, but the updated Hooded Rain Jacket has received some very useful upgrades, namely: two front pockets, a longer fit on the front, a hood with reflective strips and a more breathable fabric. Unfortunately, it is Rapha, meaning it will cost you an arm and a leg (but you’ll still have to buy the sleeves). This gorgeous jacket comes in at £230, but for that you are getting a premium product. Summary: Super stylish and super functional – but comes at a price. Buy at Rapha now for £230. 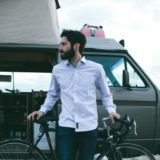 swrve have been a mainstay of urban cycling clothing industry for years, but always seem to go a bit under the radar. But what anyone knows who’s owned some of their stuff is that they are the masters of stylish clothes with great cycling functionality. The Milwaukee Hoodie Jacket is no different, offering a great urban style that certainly won’t look out of place in a bar, café or restaurant while boasting a feature reel including: three-layer 10K breathable, water-resistant material, a moisture-wicking bonded fleece interior, armpit zipper for venting, double cuffs for wind protection, a drop tail hem, shoulder seams off pressure points and YKK zippers. Simply put, this is a great stylish all-round bicycle jacket for cooler weather. Summary: A great all-round cycling jacket. Buy at swrve now for £110. Chrome Industries is another star in the urban cycling world, but unfortunately have huge fees to deliver to the UK ($65!). Fortunately, there are a few UK stockists of Chrome gear, so you don’t have to foot that unwanted bill. 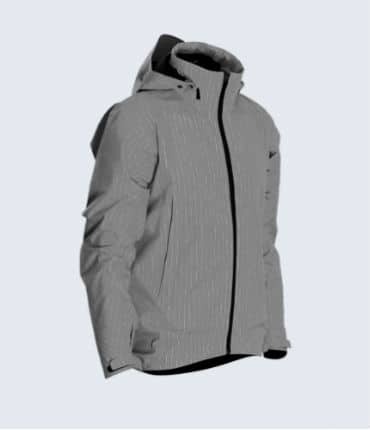 As its name suggests, the Chrome Storm Cobra 2.0 Jacket is the second iteration of this model, following what was already a very good first edition. 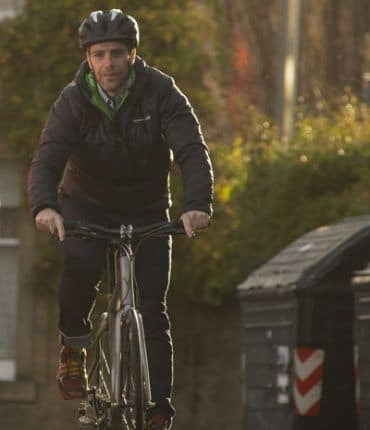 And like its predecessor, the Storm Cobra (again as the name suggests) is particularly suited to winter cycling, not because it’s necessarily warm, but because of the style, which can comfortably fit a fleece or liner underneath to keep you warm on your commute. And the Storm Cobra is a real warrior of a winter cycling jacket, it’s a three-layer waterproof with breathable twill nylon. There’s also plenty of subtle reflective features, lengthened arms and torso, as well as a two-way zipper. Plus, there’s a whopping four pockets on this jacket: two hand pockets, a wide back pocket and a chest pocket – all of which are zipped. 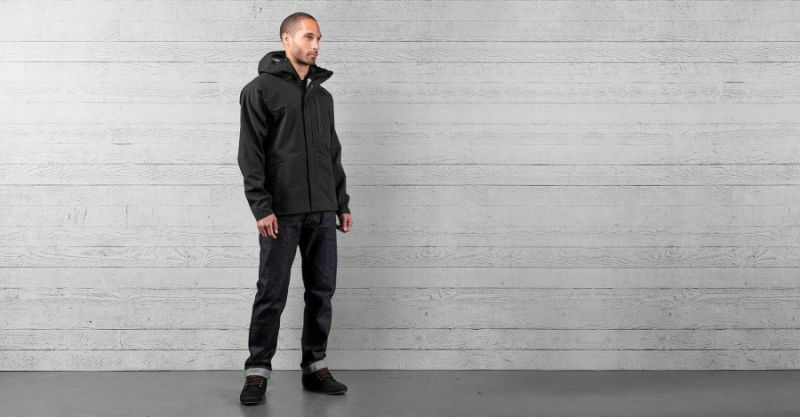 Simply put, this is one of the best urban shell jackets around. The outer material of this jacket is coarse and borderline uncomfortable at first, but you’ll be more than grateful for it when the first downpour comes. Summary: A warrior cycling shell jacket whatever the weather. Buy at Velorution now for £175. I’ve covered Resolute Bay many times, and it’s safe to say I’m a fan boy. Their product range is limited but, simply, excellent. 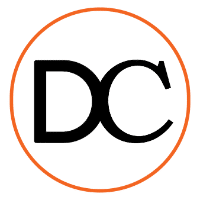 It was Resolute Bay’s range of cycling jeans which were the first to wow me, but they’ve since introduced some other products, most noticeably a reflective bicycle jacket that was recently funded on Kickstarter. 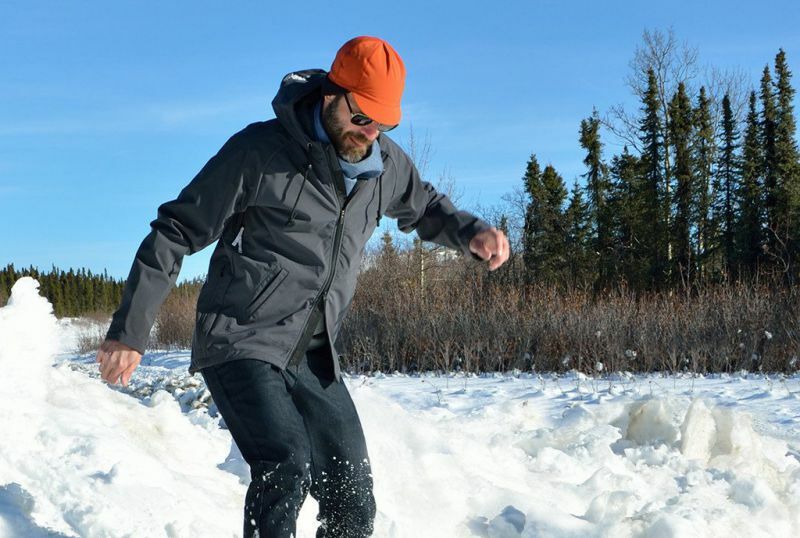 I reviewed the prototype for the jacket in 2017, but Resolute Bay then went on to add the final missing piece of the stylish-lightweight-cycling-waterproof-jacket puzzle: a packable hood. The LS2 jacket is a sleek, minimal number that is great not just for urban cyclists, but road cyclists too. It’s probably the most stylish reflective cycling jacket around currently. Indeed, the styling is great, while the reflective pin-striping through the jacket means it bursts into life light when exposed to bright lights. It’s very light and easy to pack away without consuming too much space. 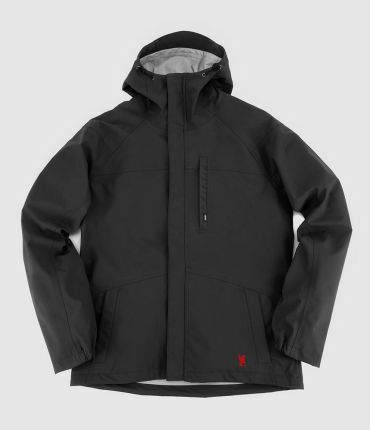 As a lightweight waterproof bike jacket, the LS2 tickets pretty much every box, it’s waterproof, light, breathable, is subtly reflectively, has secured pockets, a storable hood and looks damn good. Summary: Light, waterproof, reflective jacket that looks good. What more can you ask for? Buy now at Resolute Bay for £150. 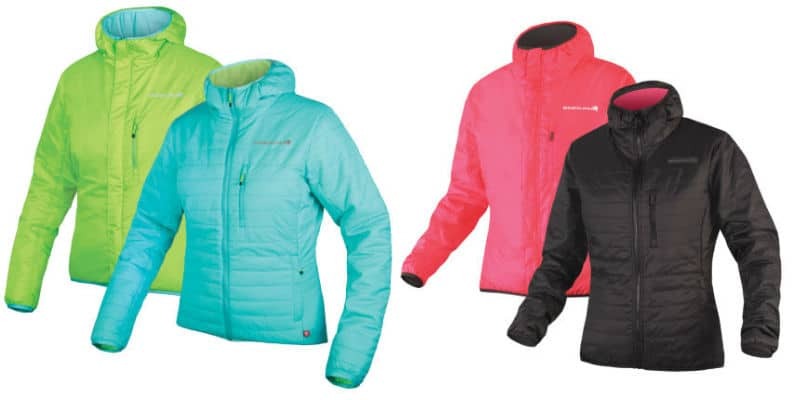 It’s double trouble for Endura’s Reversible Jacket which has made the top 5 best waterproof cycling jackets for both men AND women. Indeed, the women’s jacket is very similar to the men’s version, which is as a stylish urban number worn one way and a high-vis jacket worn the other. The difference lies in the colours, Black with a Pink hi-vis reverse, or turquoise with a lime green reverse. Again, this jacket is very much a cool weather piece and has been designed to keep you warm at around 8˚C to 10˚C with just a t-shirt underneath – so this shouldn’t really be thought of as a lightweight summer jacket. Also, this isn’t one of the more breathable jackets around – which is fine for casual riders in cool weather – but if you like to dash about at Froome-like paces, you’ll overheat in the Endura reversible jacket. This jacket originally retailed for £119.99, but you can now pick it up from £65 from the likes of Wiggle. Buy at Wiggle now from £65. Another stylish-yet-functional cycling jacket for women in the Fishtail Trench from No Such Thing, which again, looks superb. This trench is packed to the rafters with discreet functionality, boasting, no less: waterproof, windproof and breathable material, removable sleeves, under-arm ventilation, reflective back panel and hand pockets. And while the Fishtail Trench isn’t necessarily designed to be packed into a tiny bag, you can fold it up no problem with the material doing a great job at preventing creases. The only disappointing factor with this jacket is that it doesn’t have a hood, which really would have been the icing on the cake. Summary: Super stylish, super functional… if only it had a hood it would be perfect. Buy at NoSuchThing now for £210. 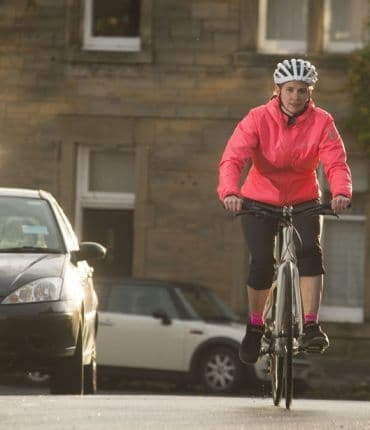 This Craft cycling jacket is a great all-round lightweight waterproof jacket for women, boasting taped seams, stretchy material and an under-helmet hood. With a simple, clean design, this is a cycling jacket that doesn’t necessarily look like a cycling jacket – which is no bad thing. Whether you’re ambling around town, meeting friends or riding through a storm, the Craft Ride Rain Jacket will take care of you. Unfortunately, there’s no reflective features on this jacket, nor are there hand pockets, although there is a zipped back pocket for any essentials. Elasticated cuffs will also help keep your arms warm, while this jacket for ladies is also very breathable with mesh lining and ventilation holes. This jacket has a massive range in prices, starting at £27 up to £100. If you can get your size under £60 your in for an absolute bargain. Summary: The good all-rounder at a reasonable price. Buy now at Amazon from £27. 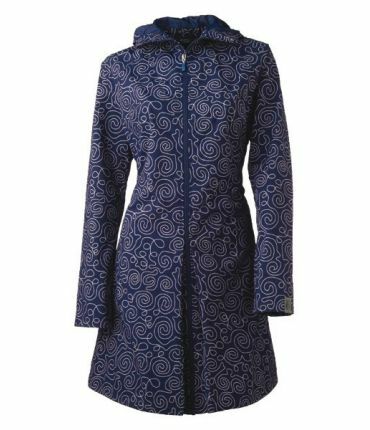 If you’re on the lookout for a chic cycling jacket/coat for women, then you’ll struggle to find anything chicer than the AGU SEQ Rain Jacket. This jacket is so cool in terms of style and function, in fact, that it received a Red Dot Design Award. So, why’s this jacket so special? Well, it’s appearance certainly is eye-catching swirling pattern and longer fit and could be mistaken for any designer coat. But the SEQ Rain Jacket also puts just as much importance on function as it does on style, maintaining a waterproof, windproof and breathable membrane. It also doubles up as a ladies’ cycling poncho, if you want to stay completely dry in the rain. There’s even a comfortable hood and hand pockets. The fit is described as a “tailored Princess line”, ensuring a flattering look. 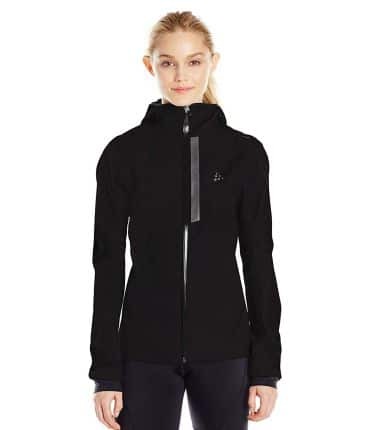 Summary: Incredibly chic jacket with a hood that is both waterproof and breathable. Simply put, the As Bold As Drench Coat is the ultimate all-round stylish cycling jacket for women: it’ll keep you dry, warm, visible and looking good. Packable hood? Check. Waterproof? Check. Breathable? Check. Stylish? Check. Dropped back? Check. Reflective panelling? Check. Zippered waterproof pockets? Check. It really does the lot. At £146, I expect a lot, but with so much discreet functionality, you get everything you pay for and more. Summary: Superb functionality and beautiful design make this the BEST waterproof rain jacket for women. Buy at Velorution now for £146. And there we have it: the top five waterproof cycling jackets for men and women that ACTUALLY look good. COMMENT BELOW: Have a favourite that I’ve missed off the list? Let me know in the comment section below. Also, if you’ve used any of these products, let us know about your experience.